Carson Van Osten`s Comic Strip Artists Kit is like Elements of Style for cartooning and tips on how to draw comic book characters. 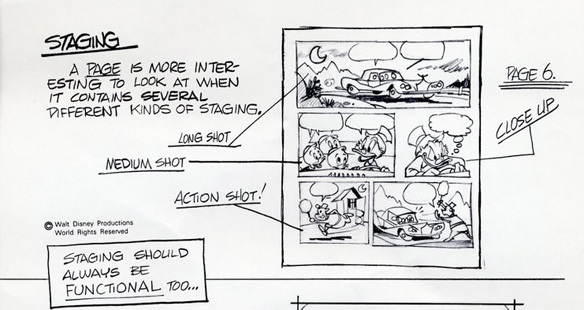 It`s a seven-page Disney comic that describes the basic rules of staging and mapping out a comics page that`s done in an enormously entertaining and easy-to-comprehend style. There have been low-res versions of this gem on the internet for at least a couple years. But recently, Van Osten emerged and sent animator, Mark Kennedy, 11`17 versions of the tutorial. Kennedy is generously sharing hi-res copies of the instructional booklet on his blog. Mark Kennedy`s blog, by the way, is a vast learning resource for illustrators. Check out his recent posts on rhythm, proportion, and (a personal favorite) offset curves.